Development of a three-dimensional (3D) sonographic technique has enabled delineation of fetal surface features, abdominal organs, and coronary arterial walls (1–5). Power Doppler imaging is more sensitive in detecting blood flow signals than is color Doppler. Kenton and colleagues reported that power Doppler offered significant advantages over color Doppler in the imaging of intracranial cerebral arteries (6). By a combination of power Doppler and 3D technology, it is possible not only to image small vessels, but also to construct 3D images of vascular structures. In this communication we show vertebrobasilar arteries imaged by 3D power-Doppler imaging. We applied a 2D and 3D power Doppler examination for the imaging of a 22-year-old healthy woman with the HDI 3000 (Advanced Technology Laboratories, Botnell, WA). The 3D imaging rendered a volumetric vessel appearance with power Doppler. Using power Doppler, we acquired flow data in a 2D slice through a volume of the vessel and represented spatial relationships within that 2D plane. We reconstructed the 2D plane data into the 3D power Doppler image. During this process, parenchymal data were subtracted. The transducer was a digital broadband steered phased array with frequencies ranging from 2–3 MHz for B-mode imaging and Doppler functions. Our patient was examined in the lateral decubitus position. The transducer was placed between the squama occipitalis and the palpable spinous process of the first cervical vertebra, and the Doppler beam was aimed at the bridge of the nose. We detected blood flow signals from the vertebral arteries (VAs), the posterior inferior cerebellar arteries (PICAs), and the basilar arteries (BAs) in real time, which were displayed as color signals within a subsector of the black-and-white image by using 2D power Doppler. Then, the transducer was locked back and tilted very slowly to image VAs (V3–V4 segments), PICAs (bilateral views), and the BA (proximal view) for 15 seconds, and collect and store 74 images in the computer memory. Subsequently parenchymal data were subtracted and a rendering of the vascular anatomy was composed with a 3D digital system. Then, 3D power Doppler images of the vertebrobasilar arteries were reconstructed. In addition, 15 images could be displayed selectively on a video monitor in dynamic partial rotation to enable viewing from different angles within the spatial range of 110°. Figure 1 shows the transducer placement and the anatomic structures. 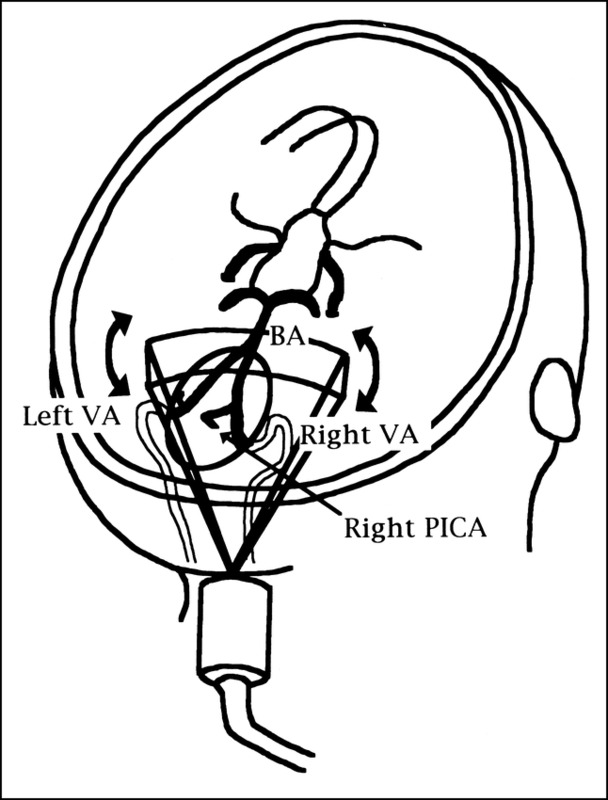 The 2D power Doppler image showed the right VA (V3–V4), part of the right PICA, and the left VA (Fig 2A), but it could not show the entire vertebrobasilar system continuously. The 3D power Doppler method, however, clearly and continuously imaged the VA, and displayed a 3D image of the BA (Fig 2B). FIG 2. 2D and 3D power-Doppler images. 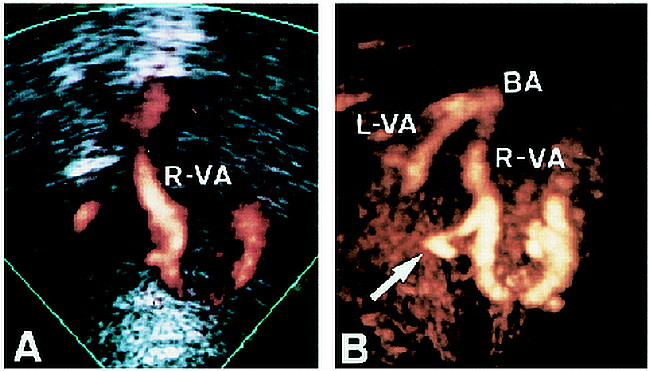 A, 2D power-Doppler image shows the right VA (segments V3–V4), part of the PICA, and the left VA.
B, 3D power-Doppler study clearly depicts the Vas and the PICA branching from the right VA (arrow). Clinical application of the 3D power Doppler method, when applied with meticulous technique and improved technology, may enable visualization of vascular diseases such as aneurysms, arteriovenous malformations, and other vascular disorders of the vertebrobasilar system. This work was supported by the Research Grant for Cardiovascular Diseases (8-C4, 9-A2) from the Ministry of Health and Welfare. The authors would like to thank Mr. Juni Warabino for technical assistance and Ms. Yuki Iwakiri for cooperation with the present study.